The nature of work isn’t the only thing evolving. Global investors also have their eyes on the U.S. housing market, and the way in which credit risk transfer has evolved, as well. In 2013, U.S. housing finance underwent a significant makeover when Freddie Mac rolled out an industry-first credit risk transfer (CRT) program. Freddie Mac’s data transparency and rigorous risk management standards and processes, which include third-party due diligence of CRT issuances, have been at the core of a remarkable growth story for both CRT itself, and for investors. In just five years, Freddie Mac has issued $38.5 billion in securitization and coverage, and more than 220 unique investors have leveraged the opportunity – and as of June 2018, Freddie Mac had transferred a significant portion of the risk on $1 trillion worth of single-family mortgages. The primary CRT investors have been money managers, reinsurers, and hedge funds, but REITs, insurers, sovereign funds, and banks and credit unions have also allocated to CRT issuances. To catch up with the latest on the CRT program, and explore the distinguishing characteristics of the capital markets and reinsurance aspects of the opportunity, II sat down with a trio of Freddie Mac CRT experts (below, from left to right): Kevin Palmer, Senior Vice President, Portfolio Management; Mike Reynolds, Vice President, CRT; and, Gina Healy, Vice President, CRT. II: What is the state of play and outlook for the U.S. housing market today? Kevin Palmer: Institutional investors today have a greater access to investing in U.S. residential credit risks than they may have ever had before. Between Freddie Mac and Fannie Mae, we have transferred mortgage credit risk on about $2 trillion of mortgages, and that amount continues to grow each day. Even if you just look at the secondary markets as it relates to STACR [structured agency credit risk, Freddie Mac’s flagship CRT offering], we have more than $2 billion that trades in this asset class on a monthly basis. The access and ability to invest in U.S. residential credit risk is unprecedented, and it has become mainstream for most institutional investors looking for exposure to this type of risk. Mike Reynolds: The U.S. residential credit market is fundamentally strong. The consumer balance sheet is also very good. The home price forecast is not as robust as it has been in recent years, but we are still projecting a very healthy margin over the next couple of years. Gina Healy: As the credit risk manager, we continuously make sure that the quality of the loans coming into our portfolio meet our prudent lending guidelines, and we’re making significant investments in technology to make sure that the performance meets our expectations. How has the CRT market evolved in the five years since its inception? Reynolds: The biggest change is that CRT has evolved from a small pilot program to a mainstream product. Early adopters were largely hedge funds. Today, we have over 220 active investors and many of those investors are money managers. Most of the top institutional fund managers are participating in CRT. Healy: From a reinsurance perspective, we’re very pleased with the global market adoption of the product. We’ve expanded not only to the European continental market, but also to some of the Asian capital market. Parent companies and their subsidiaries are investing, and we’re eagerly expanding the global footprint. Palmer: As we’ve seen the appetite from institutional investors grow, we’ve looked to further expand our offerings. For example, we expanded into 15-year fixed-rate collateral after starting off at 30-year fixed-rate collateral. We did an additional offering on HARP loans, the refinance program that was established during the crisis, and that has been very successful. We’re constantly looking to see what additional risk we have in the portfolio that can be offered to investors. Gina, you mentioned more global market adoption. When did you start to see that take shape? Healy: Reinsurers are predominantly based outside of the U.S., so it has been a gradual expansion. More than two-thirds of our investors today are global. It requires a lot of education and market adoption, but as the program has become more mainstream and several investors in the reinsurance market have participated, it has attracted interest among other reinsurers. The actual performance of the transactions has been very favorable, and we’re actively working with expanding the various reinsurance markets to make sure we have continued participation over time. What is the appeal of STACR compared to other fixed income products that provide exposure to the U.S. housing market? Reynolds: Three main things: programmatic issuance, diversification of risks, and the outsourcing of the credit risk management. It takes time and effort for institutional investors to get approval to purchase a STACR product and to understand the risks associated with it. But once they have received approval, they gain an opportunity to access transactions that are consistently coming to the market. We’re in the market at least two times per quarter. This creates multiple opportunities to buy and facilitates a very robust secondary trading market. In terms of diversification, the footprint of Freddie Mac is across the whole U.S., and it’s very difficult to replicate that type of diversification. A typical size transaction is from 50,000 loans to 150,000 loans. The size creates a substantial benefit, for example, in the context of how disasters can impact particular geographic regions which have been in the news a lot lately. Our pools are so diverse that the impacts of disasters are substantially reduced in comparison to the impact on asset backed securitizations. Just as important, we’re the credit risk manager, and we actively maintain skin in the game. We hold on to a significant portion of the risk that we are managing on behalf of investors. Effectively, investors are hiring us to perform a variety of functions for them such as third-party risk management, loss mitigation activities, and quality control, for example. Other asset classes don’t have that same type of leverage. There’s been various forms of credit risk managers that have been introduced in certain transactions, but their scope and their authority are just a fraction of what we do. That ultimately adds a lot of value to our program. Could you expand on that? What do you bring from a risk management perspective? Palmer: We have a $2 trillion guarantor portfolio, and various specialty groups are set up to manage that risk – everything from establishing how borrowers, properties, and homes are underwritten, to establishing a credit box and LTVs [loan-to-value], and so on, all with the goal of quality control. 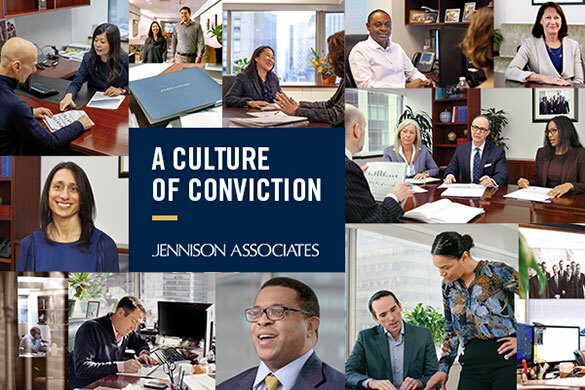 Also, given our relationships with our on-the-ground risk managers at different originators and servicers across the country, we are able to better influence and effectuate that risk management. If we have concerns about what’s going on in a certain shop, we immediately get on the phone and talk to the head of servicing or the head of risk management at any of these companies and talk through our issues. We still issue repurchases for anything that does not meet our underwriting guidelines. 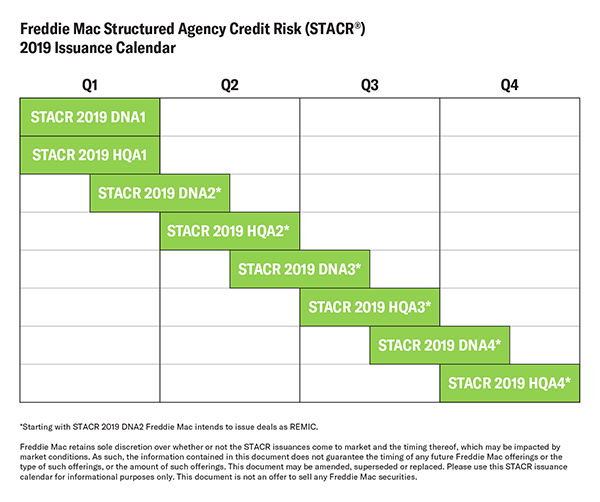 Freddie Mac recently introduced a new twist on STACR with STACR Trust. What should investors know about that? Reynolds: STACR Trust is the most viable, long-term CRT vehicle for the securities markets. Credit risk transfer is now ingrained as a fundamental part of how U.S. housing is financed, and we think it’s really important to set up the structure in the most sustainable way for a variety of future scenarios. Today, Freddie Mac is in conservatorship and we have a specific government backing from the U.S. Treasury in the form of a preferred stock purchase agreement, or PSPA. The support the U.S. treasury gives to Freddie Mac is a source of great comfort to Freddie Mac’s debt investors. There may be a scenario where the market charges a much higher counterparty premium and is not as comfortable taking that direct exposure to Freddie Mac. The advantage of the trust is that it’s a more typical structure where the bond proceeds are isolated in an independent trust. In the event of a default, investors would be able to lay claim and collect proceeds from the trust versus from Freddie Mac. Again, it’s not particularly material in today’s scenario, but it could become much more relevant in the future. Is there any remaining hangover or stigma from the financial crisis as it relates to institutional investors’ perceptions of the U.S. housing market? Healy: Investors have long memories, and this is where our role as the credit manager becomes really important. We are very proactive in making sure investors understand the fundamental changes that have taken place in tightening our underwriting guidelines since the crisis, and ensuring the quality of the loans we purchase into our portfolio meets the guidelines. We spend a lot of time educating the investor base about the underlying performance and analytics. Reynolds: Investors can observe how credit performance has improved post-crisis. 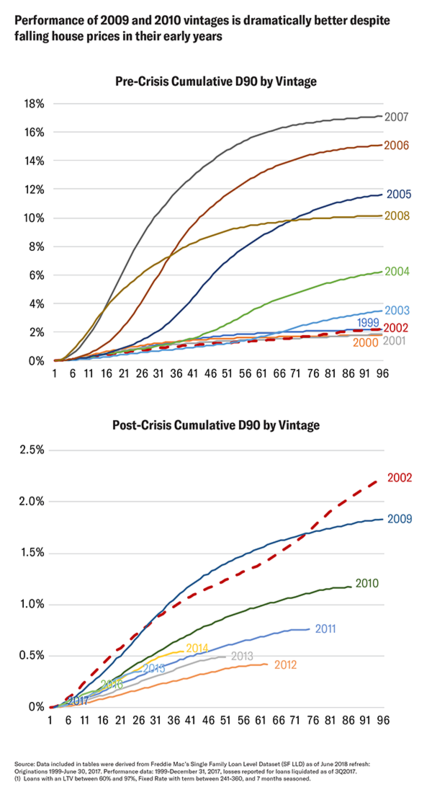 If you look at early stage delinquencies for vintages prior to 2009, and compare those to post-2009, the performance for recent vintages are dramatically better and current delinquencies are just a fraction of what they were. This is a message we are working hard to get out to institutional investors. Tight quality control is the second pillar of Freddie Mac’s credit risk management program. This includes a post-closing credit review to identify and understand any underwriting defects that might lead the enterprise to remove the loans from the credit risk transfer population. Freddie Mac also reviews private lenders’ and servicers’ compliance and quality control policies, procedures, and practices to be sure they meet its high standards. The agency also has a team that makes on-site visits to lenders around the country to verify that appropriate controls are in place throughout the origination and servicing process, and to identify any areas for improvement. Along with Freddie Mac’s internal credit risk management program, the agency has instituted a third-party verification system that provides even greater transparency and assurance for institutional investors. According to PwC, real estate transaction activity in the U.S. was up year-on-year in deal value and deal volume through August 2018. That’s good news and an about face from year-on-year declines in 2016 and 2017. The increase was driven by portfolio and entity-level transactions, per PwC. 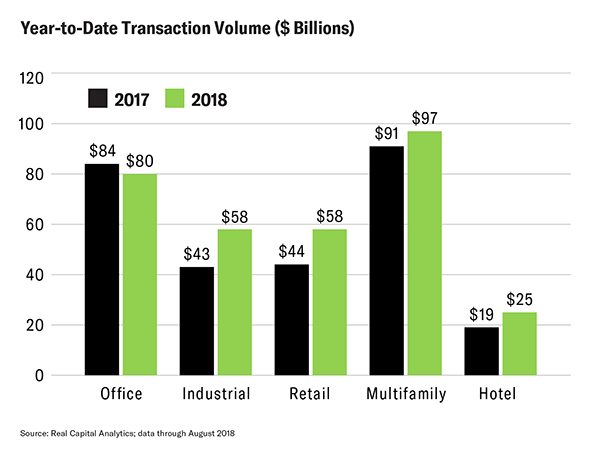 Total transaction volume through August 2018 was up more than 12%, but while transaction volume increased, the pace of valuation increases slowed along with cap rate compression. Through H1 2018, valuations were up 6% compared to year-over-year increases of 7% in 2017 and 9% in 2016. Prior period activity was largely supported by sales activity of single assets, and the increase in volume was primarily driven by increased portfolio and entity sales, particularly in the industrial, retail, and hotel sectors. Portfolio and entity level activity for industrial assets grew 75% year-over-year during the H1 2018, and is expected to remain solid as e-commerce growth ramps up and investors seek exposure to last-mile facilities. Entity level transactions are even more pronounced in the retail sector. Total volume was up through H1, but it would have declined 23% were it not for Unibail-Rodamco’s acquisition of Westfield, which closed during the first half. 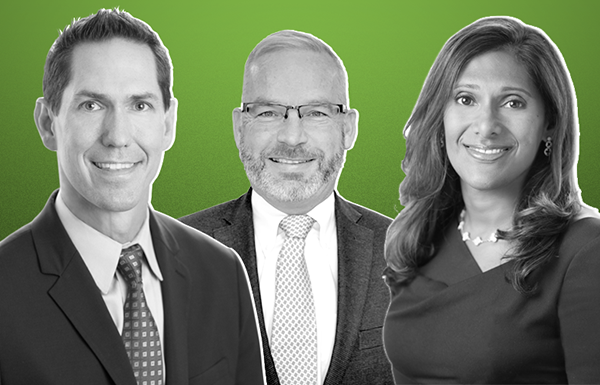 Single asset volume declined 12% year-over-year during the first two quarters, particularly for single-tenant assets that tend to be susceptible to interest rate increases given their long-term lease structures. The first half of 2018 also saw volume increases of 18% in hotel transactions, driven by a 215% increase in portfolio and entity-level transactions. It’s worth noting that activity was concentrated in non-major metros, which experienced a 36% increase in volume compared to a 21% decline in gateway markets as investors continue to seek yield.